Drs. Henry Cloud and John Townsend--the authors of the award-winning and bestselling Boundaries--have written the handbook for having that difficult conversation you've been avoiding. Includes a discussion guide. 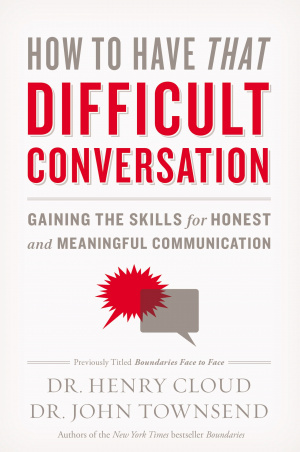 How to Have That Difficult Conversation by Henry Cloud; John Townsend was published by Zondervan in August 2015 and is our 63116th best seller. The ISBN for How to Have That Difficult Conversation is 9780310342564. Be the first to review How to Have That Difficult Conversation! Got a question? No problem! Just click here to ask us about How to Have That Difficult Conversation.